Here's a shocker that's right up there with "Dog bites man:" Rupert Murdoch's not terribly concerned with censorship in China. 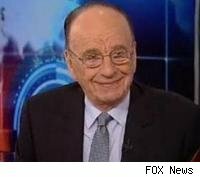 In a fluffy, cuddly puffball of an interview on Fox Business, the News Corp. chairman was asked by his employee and interlocutor, Neil Cavuto, about a report that China is requiring PC makers to pre-install software blocking certain websites deemed unacceptable by the government. "I'm not worried because we don't do any business there, or so little that it doesn't matter," Murdoch replied. Cavuto pressed on, wondering if, News Corp.'s interests aside, Murdoch thought U.S. companies ought to be helping a totalitarian government crack down on free speech. Murdoch: "I don't object to that. You can't expect great companies like Dell or Hewlett-Packard or others to say, 'We're going to sell no computers in China at all.' It's too big. It's too big a part of the world." Well, certainly you can't expect it when your own "great company" notoriously made its own kowtow to Beijing, pulling BBC News from Star TV in order to get the satellite channel into China. More recently, News Corp. empowered serious censorship with its launch of MySpace China; the site, in which News Corp. owns a minority stake, prohibits chatter about politically sensitive topics and encourages users to inform on one another. It doesn't seem to ever bother you when you've been criticized in the press. I think you and [Fox News chief] Roger Ailes seem to take it like water coming down your back, but nevertheless, does it bother you when you've established this news and media empire that's pretty much the envy of the world right now, and you're kind of like the Rodney Dangerfield, not getting that respect? Where could Cavuto ever have learned such groveling diffidence to power? Oh, right.